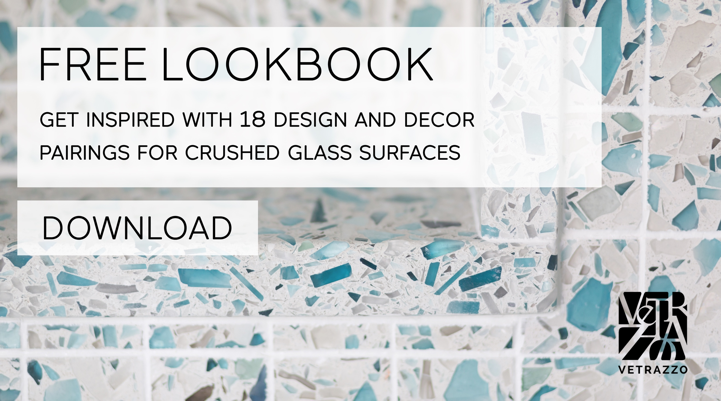 There was no way we could pick just one as our favorite so here's a look at 10 stunning designs featuring handcrafted, American made, slabs of recycled glass. Laura U Interior Design hit the perfect balance of sea inspiration and sophistication with this chic kitchen for a Houston getaway home. The kitchen is eclectic and modern, without being sterile or formal thanks to traditional furniture touches, simple cabinetry and a dose of turquoise. Step into the open plan space and you can exhale out that city stress and breathe in that clean, salt air flowing into the light airy space. She centered her design around Vetrazzo’s Floating Blue countertops atop fresh white shaker style cabinetry. Though it resembles sea glass, the surface is actually recycled architectural 'float' glass named for the reflective coating you see on the exterior glass of sky scrapers, mixed with a white cement binder. With more and more designers and homeowners asking for texture and intricacy in their surfaces, this year we unveiled a new finish for Vetrazzo slabs: Sea Pearl. In this finish the glass pieces seem to rise up gently out of the concrete surface with the texture of a worn piece of sea glass, but with an opalescent quality of a pearl, like bubbles rising to the surface of sand under the surf. In this seaside bath, designer Toni Sabatino used Sea Pearl finished slabs in Floating Blue for the glass countertops, shower curbs, jambs and niche. She also paired it with our classic polished finish 2" x 2" mosaic tiles in the shower wall and pan. The texture and color of the surfaces, and their ability to catch and reflect light transformed the small space into a precious jewelry box. 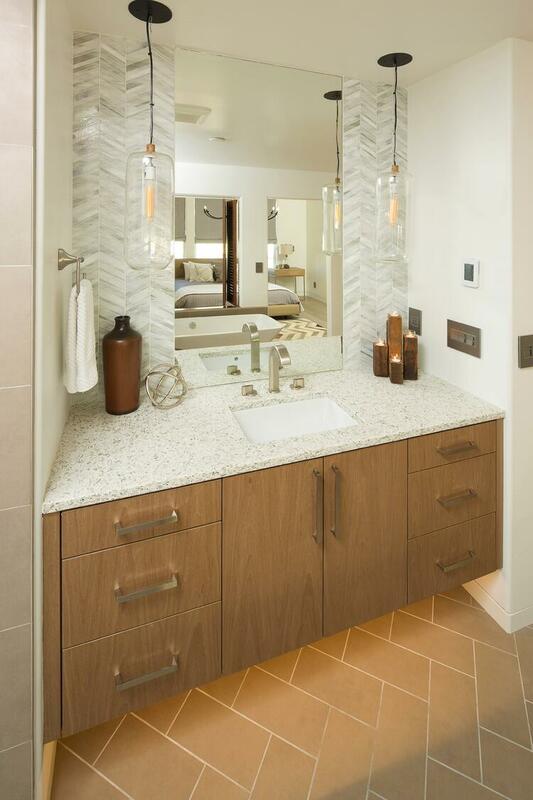 In her design for an upscale California beach condo, designer Stephanie Rothbauer focused on visual impact with pattern play and mixed materials, and environmental impact with local and recycled materials like Vetrazzo. “We tried to do everything eco-friendly,” she said. Sustainable countertops, wood veneered cabinets and recycled glass tiles were used throughout the home. Her interior which incorporates Martini Flint recycled glass countertops in the kitchen, three bathrooms and a fireplace hearth, is all about mixing materials: concrete flooring, plaster and wood walls, wood veneer doors, recycled glass tiles and even porcelain tile on the stair risers, all in a sandy palette. In the master bath Rothbauer picked up the glass from the Martini Flint vanity top and carried it up the wall with a herringbone tile. Despite the neutral colors there’s nothing beige about this home. Rothbauer relied heavily on the patterns and visual texture of Vetrazzo’s Martini Flint and glass and porcelain tiles from Fireclay Tile and Oceanside Glasstile to give every room the same dose of movement and interest as the ever changing coastline. Winners of this year's Vetrazzo Design Star Contest Arkin Tilt Architects chose this waterfall design for the island to showcase the beautiful face of the Vetrazzo overlooking the living and dining spaces. 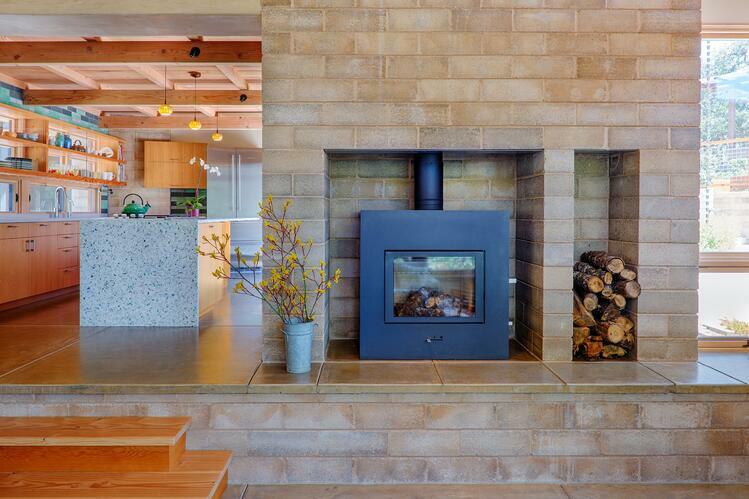 The kitchen is the heart of this sustainable home which features passive solar and a living roof. 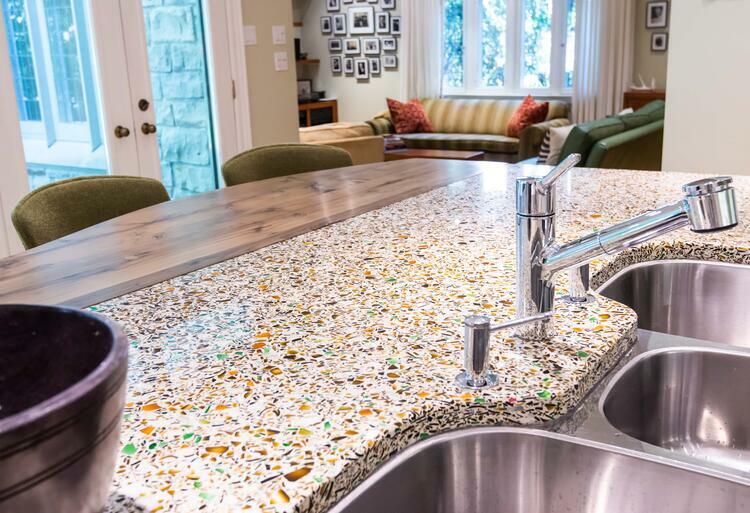 David Arkin and Anni Tilt regularly use recycled glass countertops in their designs of earth friendly homes and buildings. 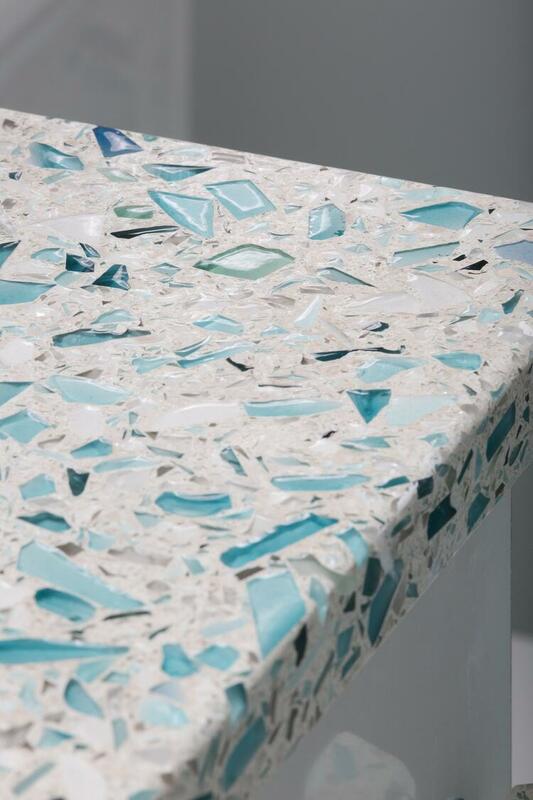 "Vetrazzo allows clients to express their conservation with a very overtly recycled material." Use of Vetrazzo's recycled slabs and tiles provide LEED credits. Arkin Tilt were early adopters of Vetrazzo, spec'ing the material for jobs more than 20 years ago when the company was originally founded in Berkeley. Arkin said that he and his team worked directly with the craftsmen on creating the first slabs and even had a homeowner participate by drinking the soda from the specially colored glass bottles they wanted incorporated into their slabs. At The Houston Brewery beer fans can come for brewing and history tours before settling down on the cowhide stools of the expansive bar topped with Vetrazzo’s Alehouse Amber. The recycled glass mix features the classic amber beer bottle as well as green wine bottles in a white cement aggregate. 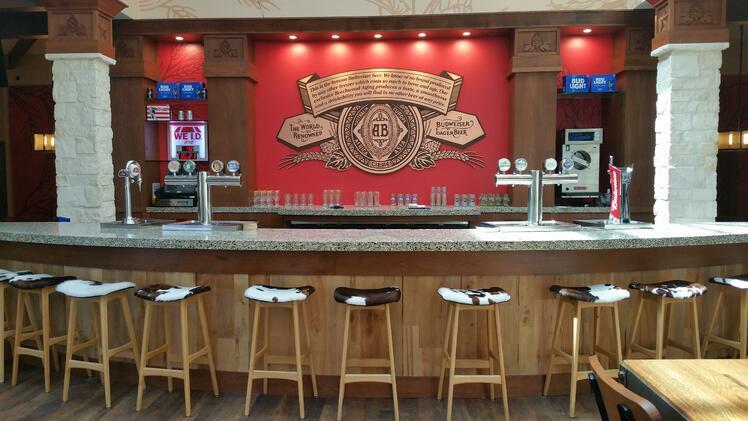 JED Countertops fabricated the bar from material supplied by Latera Architectural Surfaces. When Judy Moore was shopping for a countertop for her North Carolina beach home she fell in love with the look of Bretagne Blue with it’s turquoise tones and Georgia marble pieces, but the price seemed out of her reach. She briefly considered settling for a lower end recycled countertop from a home store but that was a dream killer. Instead Moore made her favorite kitchen element, the Bretagne Blue recycled glass, her focus and made finishing, lighting and appliances choices that would allow her to have the Vetrazzo while staying on budget. “It's about choices,” Moore said. 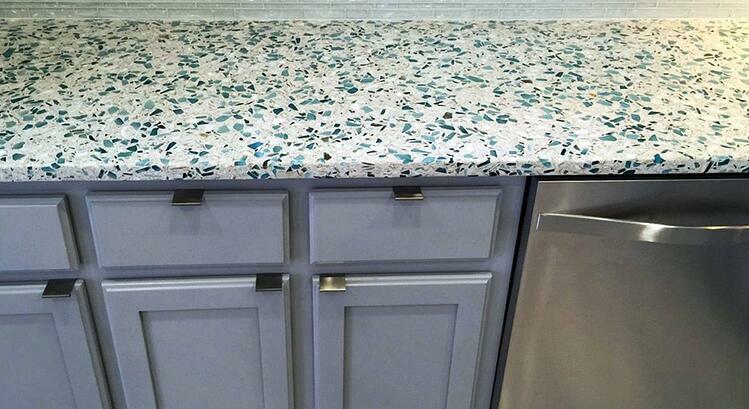 “I really wanted the Vetrazzo so in exchange I saved in other parts of the renovation. I did some work myself, like some of the easier painting and I made other items we needed instead of purchasing them.” The considerable savings on labor and furnishings she said, allowed her to have what had always been her dream material. When an eco-conscious family wanted to transform an outdated kitchen they turned to designer Catherine Friis to create an eco-friendly and stylish space reflective of the Toronto woods just outside their door. When they came to Friis the clients had already found recycled hemlock from the docks in Lake Ontario that they intended for a dining table top. This kitchen faces north and with that dark wood Friis knew she would need to brighten the space if she was going to use it on the island and cabinetry as well.. Her inspiration came when she discovered recycled glass countertop material on a trip to Ciot Technica for tile. "We were working on one of their big tables with our piece of reclaimed wood and the inspiration photo, we looked down and noticed this amazing material we were working on - Alehouse Amber Vetrazzo - was a perfect compliment to our palette, plus is was made from recycled glass." Friis said color, look, sustainability, durability and uniqueness all drove the material choices, "but everything was so beautiful there was no compromise in function or style." 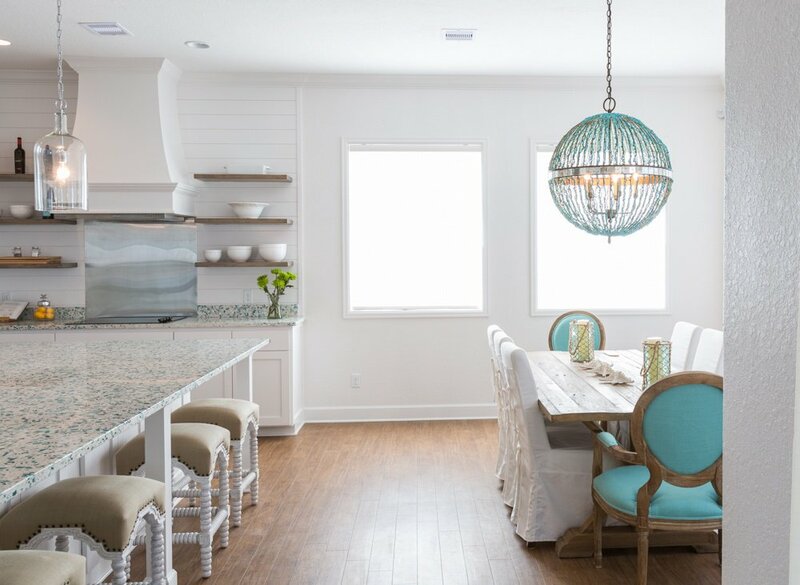 Located in beachfront Tequesta, Fl, Patty Anderson of Waterview Kitchens is used to designing bright coastal kitchens with a sea glass look and feel. But this Jupiter, Fl luxury beach condo packed the most color punch of them all. Anderson even found a way to create storage that's both smart and colorful by creating a nook behind an oddly angled refrigerator and topping it with a piece of the recyled glass countertop. Karen Bednorz loves cobalt. In fact, you can find it in just about every room on her main floor, in a collection of blue glass in the kitchen, a lapis wall in her living room painted by an artist friend and blue art glass in the dining room. Bednorz is an art buyer for Patagonia. She's been with the company for 31 years and shares both it's penchant for beauty and conservation. That Vetrazzo is made in the United States with recycled materials and fits her design aesthetic made it a perfect match for her. 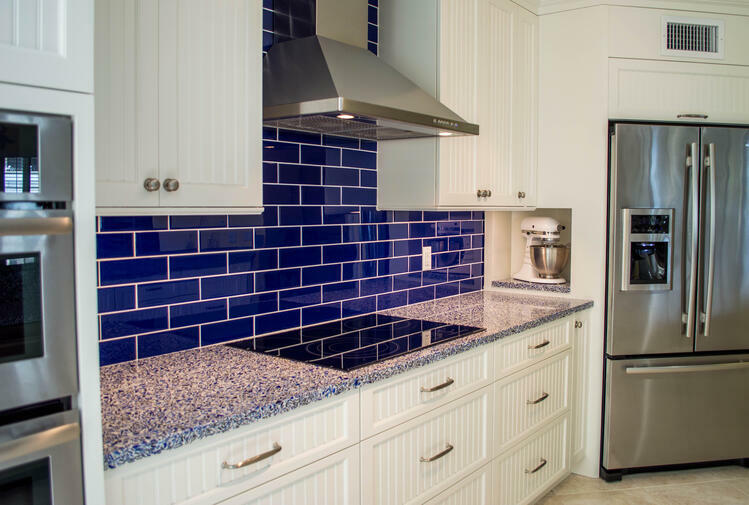 The main feature of the Chivalry blue color mix she chose for her countertops is its signature cobalt blue glass pieces and large aggregate size. Though every slab of Vetrazzo is unique, even within the color mix, Bednorz chose her specific slabs from Pacific Stoneworks for their individual color character. "More than just the cobalt, they had all the colors I wanted, deep peacock, sea foam green, all the colors that call to me and calm me," she said. 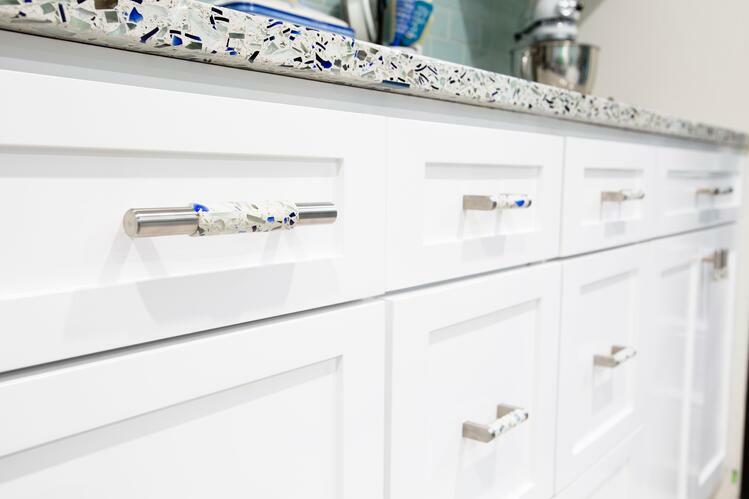 An added bonus for Bednorz was the Vetrazzo recycled glass hardware which gave her the chance to make every last inch of the kitchen match her blue and white dreams, and her favorite place to be. 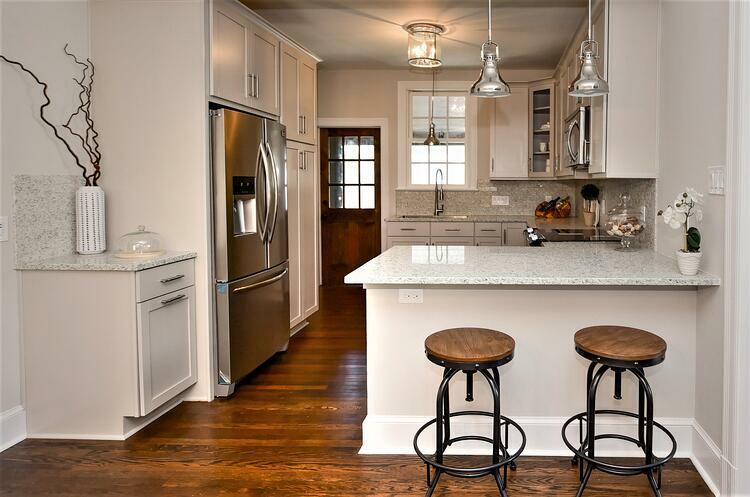 "When I’m sitting at the breakfast bar with sun coming in it sparkles,"
Ready for some more recycled glass looks for your kitchen and bath? Download our free lookbook.